Pinstripe Pants Bullet by Catch. Stay on top of the military trend in these original pinstripe pants. Brown and khaki skinny-striped trousers detailed with small army-inspired graphics. Constructed with button and zipper fly, front and back pockets and belt loops. 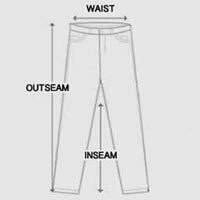 Pinstripe pants made from smooth cotton blend with slight stretch. Includes attached rope wallet chain with antique brass hardware. Ankle cuffs finished with folded hems for a neat trouser look. Pinstripe pants designed with a low crotch and tapered fit for military cool with non-stop comfort. Rope wallet chain is not removable. Model is wearing size 32. For accurate measurements, check the table below.